For centuries, the only way to reliably join two fabrics was through sewing. But some industrial fabrics can be quite tough and difficult to sew effectively. This method can also create a visible seam that can ruin the aesthetics of a project. Industrial fabric welding solves both of these problems. If you are joining industrial fabrics for items that are known for durability and strength, such as tents, awnings, truck tarps and related materials, a quality industrial fabric welding machine from MarkPeri is the ideal solution. Using the right industrial fabric welding machines can create strong bonds without leaks or cracks as well as provide better resistance to abrasion, a durable, long-lasting seam, greater water-resistance, lower maintenance costs and a streamlined finish. We provide industry-leading fabric welders that are durable, reliable, and effective. Contact us directly today so we can learn more about your specific equipment needs and provide a lasting solution. Once you know you are looking for an industrial welding machine for fabrics, what kind of machine will you use? We recommend one of our Radio Frequency bar welders. These machines use radio waves to heat the bars that can then heat your fabrics to soften them, and with the right amount of pressure, seal them together. The heating procedure is similar to that your microwave uses and is fast and highly effective. Why Should You Use RF Bar Welders for Industrial Fabric Welding? There are other types of industrial welding machines for fabrics, but we believe that few are as efficient as the RF bar welder. The action of the RF heating makes it much less likely to damage your fabrics during sealing, and there is no smoke or other toxic gas released into the air as a by-product of the sealing process. The end result of RF bar welder sealing produces a streamlined, quality appearance for your project. 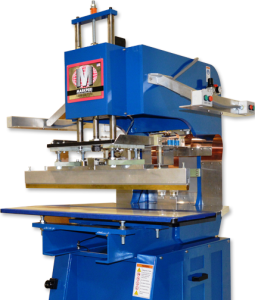 At MarkPeri, we are the fabric welding machine supplier you can trust because we are the unquestioned experts when it comes to radio frequency machines. MarkPeri has been in the RF machine business for over three decades. We have rebuilt and refurbished RF machines that work like new at a price that fits your budget. We also have state-of-the-art equipment and can customize a solution to your specific goals and financial considerations for your company. Additionally, we offer quality repair support to get you right back on track should you encounter any difficulties down the line. We are confident we have the right RF bar welder for your fabric welding needs. Our emphasis on customer service, our years of experience and our commitment to helping our partners find the ideal welding equipment solution keeps our customers coming back, and we would love for you to join our family. For additional information on the industrial fabric welding process, the various RF bar welders and other equipment we have available or for help finding the right industrial fabric welding solution for you and your business, please contact us today.